Today I want to talk to you about how to make money with shareasale and other affiliate companies. Sometimes Amazon just isn’t available to you, or you want to make a higher percentage per sale– that is where these come into play! I (Becky) live in North Carolina and for the longest time, we were not allowed to be a part of the Amazon Associates program, so I had to find other means of affiliates sales. I went with ShareaSale, Commission Junction, linkshare and a few others. What are these companies? They are companies that work with merchants. The merchants then pay a commission for sales generated through your affiliate link. They are all free to join, but you will have to apply and wait to be accepted. 1. Visit their page. Play around with their merchant list. I found some great merchants, like ABCMouse.com and Craftsy.com. These bring in a lot of sales for me because I can use them in my posts a lot (Craftsy offers a LOT of free things, like free photo classes, etc… and ABCMouse.com is just a great website, so I can talk about it in education posts). Be sure that you find some that you like. I suggest checking out their TOP 100 companies – it will give you a list of their highest-earning, most popular merchants. Click on the SIGN UP button. Create your username/password. Fill out your info (location, your webpage, etc…) Now you just have to wait about 1-2 days for your application confirmation to come through. 3. Once you are signed up, use it just like you would use Amazon. Link to certain things. 4. After logging into ShareASale Network, Click on Merchants->Search For Merchants. In the Search Box, Enter the Keyword to fit your blog. 6. Promote them. I usually add links to things. You will just go to the button that says: Links->Get a Link/Banner. Choose the merchant and click Get Links. You can pick the one that you want & add it to your blog. Do you want more tips? Check out our book! Hi Becky thanks for the tips! I did get your blogging book but haven’t had time to sink my teeth in it yet-shame on me! One question-to use any of these affiliate sites does your blog need to be a registered business? Or qualify by having a certain number of subscribers or social media stats? Thanks! Thank you for all of the info! I also live in NC and have played with my blog on and off for four years. Now that I am getting serious about it, I really appreciate all of your insight! 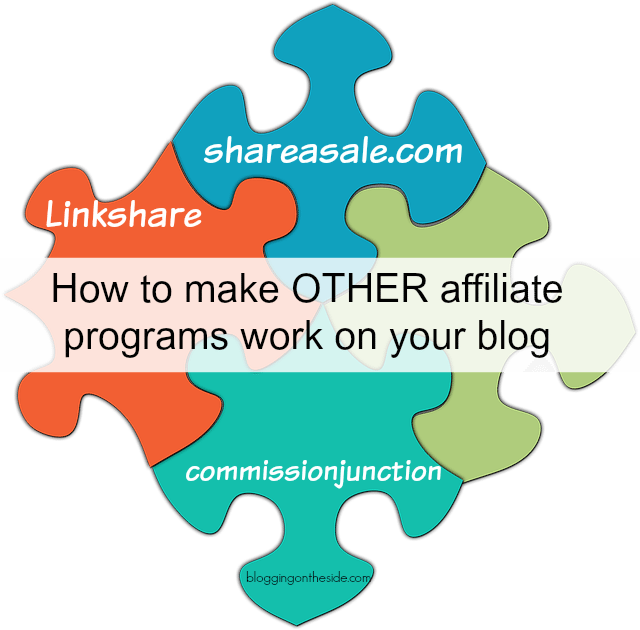 Question: I applied through Commission Junction to become a Jane.com affiliate…I was declined. Could it be because my page views are still small and perhaps my blog isn’t large enough for them yet? I would love to promote their site. Thanks! Thanks for this – super helpful! I have a question – what is the difference between finding companies on Sharesale and the like versus signing up for companies own affiliate programs? Do some companies only go through these sites?